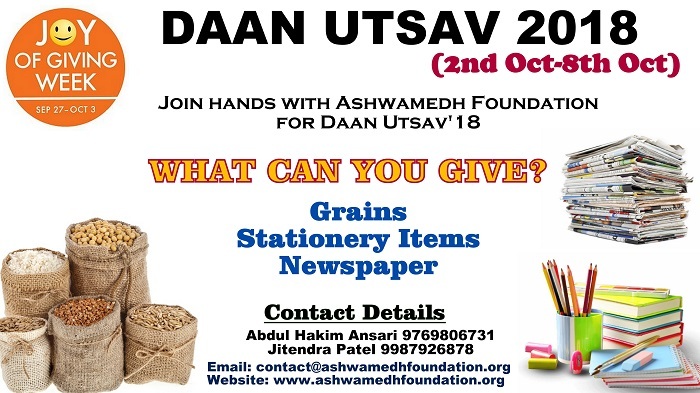 Ashwamedh Foundation is celebrating Daan Utsav since 2013. Every year we collect Stationery items, Clothes, Grains and other materials from donors and distribute it to needy people. We have helped J&K Flood victim, Nepal Flood victims by sending the collected items in past. We collaborate with Schools, Colleges, Residential Societies and Corporates to celebrate the Joy of Giving week. i.e. Daan Utsav. We had stalls in Ruia College Matunga, Sathey College, VileParle, and IDBI Quarters in Ghatkopar in past. This year too we have many activities lined up during the DaanUtsav. We request all the Donors to Visit our Website www.ashwamedhfoundation.org and Donate us to continue the good work our team is doing. Ashwamedh Foundation is an NGO working in Child Education and Development Sector since its inception in 2012. We work in Virar, Santacruz and Murbad areas. Project Ankur and Project Aakaar are our flagship programs. Let’s join hand with Daan Utsav community this year and experience the Joy of Giving. This is really the festival of Philanthropy in India. Participate! What we collect: Books, Stationery Items, Clothes, Toys, Grains etc.